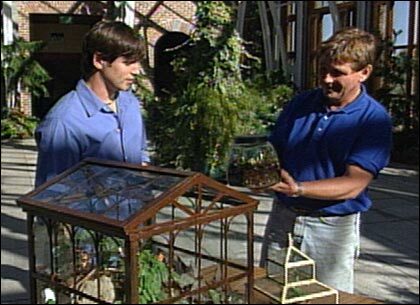 Christian Primeau offers Paul some tips on starting your own terrarium. A roomy greenhouse of one's own is the fond dream of many an eager gardener. But for those of us without the space or the budget to think big, creating a terrarium can be a beautiful, fun and fiscally feasible small-scale alternative. Garden correspondent Paul Epsom visited the impressive Tower Hill Botanic Garden in Boylston, Massachusetts, to talk with Christian Primeau about the right way to get started. The first thing to realize is that you have lots of options when it comes to choosing a container for your terrarium. Pretty much anything will qualify that allows in plenty of light, and can be closed off to create a humid environment that mimics nature's own water cycle, whereby water evaporates, condenses, falls down onto the plants, and repeats. Re-purposed containers, such as fish aquariums are often used, and Christian had on hand a number of examples, ranging from relatively small glass jars to a somewhat larger architectural container that in effect is truly a miniature greenhouse. So, for a spring gardening project that's compact, attractive and easy to tend, follow these few simple steps to be on your way to a terrific terrarium. Choose your container. 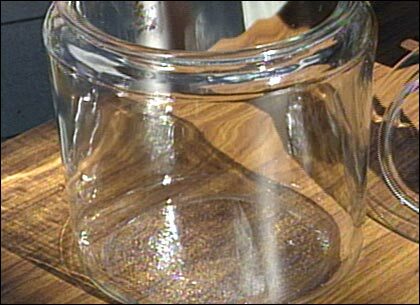 For his example, Christian chose a clear glass container specifically made for terrarium use — about the size of a cookie jar. 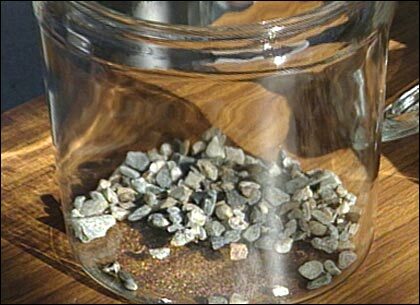 For drainage, fill the bottom with a layer of pea stone, crushed gravel, or even marbles. The point is that you don't want your plants' roots sitting in water, which will cause them to rot. 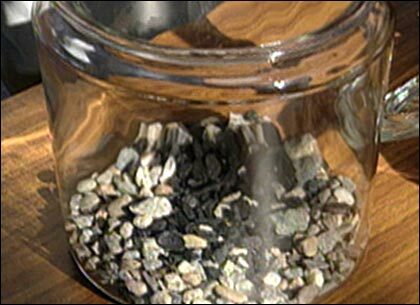 Next, add some horticultural charcoal on top of your gravel. You don't need very much, although the amount you use will depend on the size of your terrarium. Like baking soda in the freezer, the charcoal serves to freshen the environment, absorbing any excess gases that may be emitted by your plants. Then, to separate the drainage layer from the soil layer, place a piece of porous material over the charcoal. This will prevent your soil from settling into the gravel, hindering drainage. You can get landscaping fabric from your local garden center, although most porous materials — even pantyhose — will do fine. Next, partially fill the container with a pre-moistened soil mix. (Christian told Paul his "Tower Hill Special Mix" contains perlite, potting soil and a little bit of charcoal.) 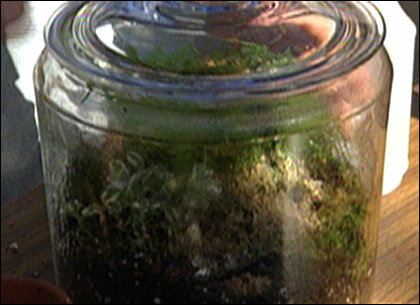 As a guide, you should prepare your terrarium with roughly 1/3 drainage and 2/3 soil. Go especially easy on fertilizer; it will increase the salt content of your soil, which can be deadly in a terrarium environment since it lacks complete drainage. Plant choices: Dwarf and slow-growing plant varieties work especially well in terrariums. For Paul's visit, Christian selected Alternanthera 'Snow Queen', deer foot's fern (Davallia canariensis), and mondo grass (Ophiopogon japonicus). Moss will thrive in this humid environment as well. 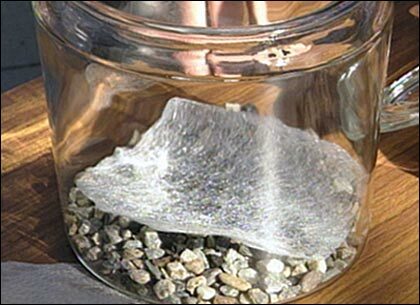 You can also add rocks and any number of decorative touches to your terrarium. Once you've planted your terrarium, give the whole thing a generous spritz with a water bottle; you want to start with a good deal of moisture to get the cycle of evaporation and condensation started. 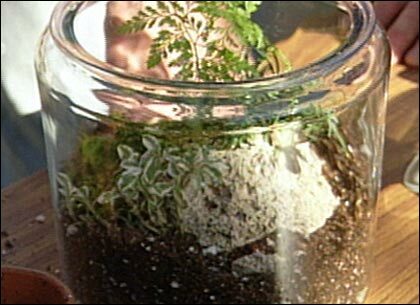 Put the top on tight, and in the morning you'll know your terrarium is off to a healthy beginning if the inside of the container is coated with mist. Conversely, if the soil seems too wet, leave the top off for a while to let the environment air out. After that, the only thing left to do is step back and enjoy your beautiful little botanical habitat! For more information about the Tower Hill Botanic Garden in Boylston, Massachusetts, visit them online at www.towerhillbg.org. This segment appears in show #2803.